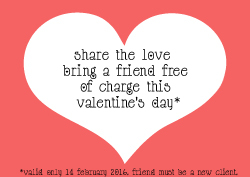 This Valentine’s Day, Zama Yoga invites you to bring your partner for a free class*! Experience the love of yoga with the one you love, and bring them in to Zama Yoga for a free class on Sunday the 14th February. *Partners must be new clients. Clients who utilise this offer will be unable to take advantage of the $25 New Client Deal. ← happy third birthday toowong!